Little Mouse’s day is filled with things to do, and little readers are along for the ride. 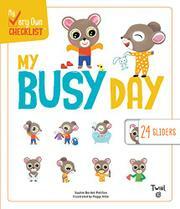 This oversized board book features two dozen sliders that illustrate the steps in various checklists that little ones can follow to accomplish different routines during the day. In the “Mealtime Checklist,” steps include washing hands, setting the table, placing the napkin appropriately, chewing thoroughly, clearing the table, and wiping one’s face after eating. For each step, the moment before an action is shown, and then the slider is moved to reveal the action in process. For “Help set the table,” Little Mouse is first seen smiling at a stack of crockery and cutlery, and then laying them out. “Chew food well” is rather enigmatic, as the “before” picture shows Little Mouse and an empty plate, and the “during” picture shows him brandishing a fork and smiling but not in any way obviously chewing either poorly or well. The spare illustrations serve the book’s nature, but little readers already attuned to routines will have little use for this title, other than fiddling with the sliders a bit. This is seemingly designed for readers reluctant to stick to a schedule, but there is little incentive here beyond sliding a tab. Younger children will just slide them all at once, and older readers will be looking for a bit more reward for their trouble.